The Riverside County Transportation Commission, in partnership with Caltrans, will be conducting preliminary engineering and environmental studies to support an Environmental Impact Statement and Environmental Impact Report for the proposed Interstate 15 Express Lanes Project Southern Extension. RCTC is leading development of this project. 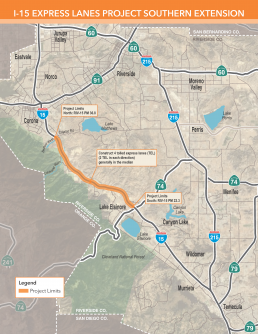 The proposed project would extend the I-15 Express Lanes currently under construction south between Cajalco Road in Corona and State Route 74 (Central Avenue) in Lake Elsinore. The 14.5-mile segment would extend from Corona, through the unincorporated Riverside County community of Temescal Valley, and into Lake Elsinore. The project proposes adding two Express Lanes in both directions within the I-15 median. 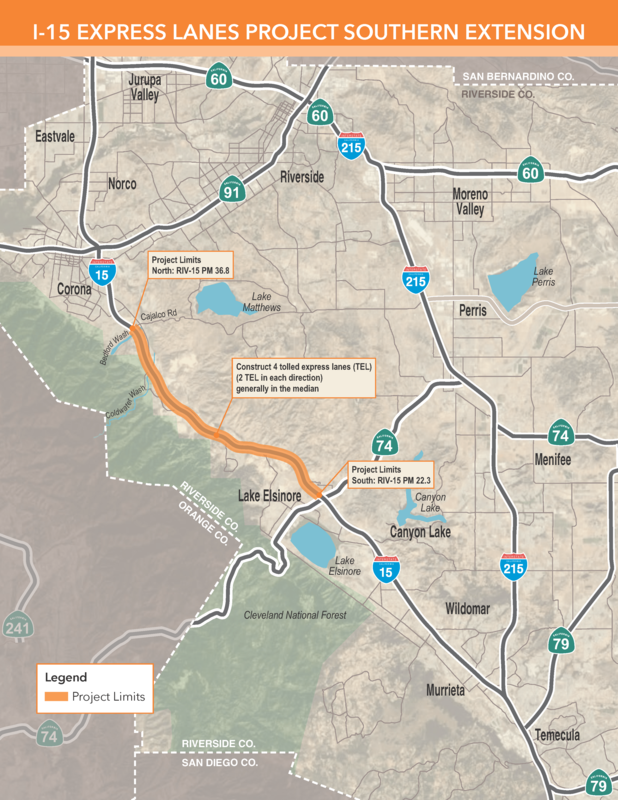 Once built, the project would expand the region’s express lanes network and provide a new transportation option for motorists in southwestern Riverside County. RCTC received $50 million in state funding in 2018 for the preliminary engineering and environmental studies. The Commission expects to select a consultant to begin this work in 2019. The Environmental Impact Statement and Environmental Impact Report phase of work will take approximately five years, due to the complexity of the project corridor, which crosses multiple jurisdictions, widens 14 bridges, and may affect numerous waterways. Pending project approval, RCTC expects to use a design-build approach to expedite the delivery of the project. Construction could begin as early as 2025 and the new lanes could open in 2028, if RCTC is able to secure funding. The total project cost is estimated to be $544 million. RCTC is exploring federal, state, and local sources, including future toll revenues, for funding. 2007: RCTC and Caltrans complete I-15 Corridor Project Study Report-Project Development Support, which included study of a 44-mile corridor along I-15 between State Route 60 and I-215 in Temecula. 2016: The I-15 Corridor Project is subdivided, and the 15-mile I-15 Express Lanes Project is approved between State Route 60 and Cajalco Road. (The 15 Express Lanes Project is currently under construction). 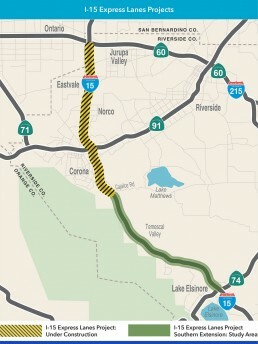 2017: RCTC seeks state funding for the I-15 Express Lanes Project Southern Extension, a 14-5-mile segment between Cajalco Road and State Route 74 (Central Avenue). 2018: The California Transportation Commission awards $50 million to RCTC to conduct preliminary engineering and environmental studies for the I-15 Express Lanes Project Southern Extension. 2018: RCTC issues a Request for Qualifications for firms to complete the preliminary engineering and environmental studies, with contract award expected in spring 2019. Record of Decision (Aug 2015), click here. Federal Register Notice of Limitations on Claims for Judicial Review of Actions by the FHWA pursuant to 23 U.S.C 139 and other Federal agencies, click here. Final Environmental Impact Report/ Environmental Impact Statement and Final Section 4(F) Evaluation (March 2015). For questions/comments about this project, please respond below. This is my first inquiry about this subject.